In the furthest reaches of Sydney's eastern suburbs, lies a peaceful beach called Nielsen Park. Enjoying a heritage status and exceptional scenic beauty, Nielsen Park is an ideal location for a quiet picnic or a gentle swim within the shark-net protected boundaries of the beach. But in a secluded corner of the Nielsen Park reserve, there is a forgotten and recalcitrant beach known as Hermit Bay. A popular destination for boats hoping to glimpse the New Years Eve fireworks, Hermit Bay is bordered by expensive real estate and historical interest, including Strickland House on Vaucluse Road, open 9am to 5pm daily. Apart from the appeal of enjoying a swim in the relaxed and gentle swells of the harbour beach, Woollahra Municipal Council advises visitors to enjoy a walk through the pedestrian pathways of Watsons Bay. At the Hermit Bay leg of the walk, the Council advises walkers to note the small rock outcrops, used for spear-fishing. 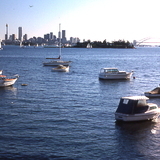 Hermit Bay is part of the Hermitage Reserve, which begins at the end of Bay View Hill Road, Rose Bay and stretches along the shoreline of Vaucluse. As a result, there are a variety of tracks for walkers to take along the line of the shore. When the allure of the outdoors has worn off, Hermit Bay is conveniently located in close proximity of a variety of cafes, including The Beach House.